This Sunday is Pentecost Sunday (Year C), the day we celebrate the coming of the Holy Spirit and call an end to the Easter Season. There are two stories of the coming of the Holy Spirit in today’s readings, and they are both very important. The one that came first is the one in the Gospel: Jesus breathes on the apostles and tells them, “Receive the Holy Spirit.” Then, later, at the end of their nine days of prayer after the Ascension, the Holy Spirit comes upon them in a dramatic way. The first coming came after his Resurrection, in a private, intimate way: He breathed on them. The second came after his Ascension in a public way: He sent a mighty wind. The first gift of the Holy Spirit was reserved just for the apostles, who Jesus visited behind locked doors. 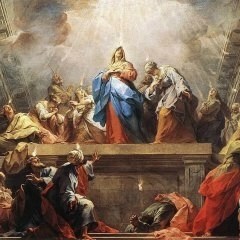 Now in the upper room, the Holy Spirit is given to Mary together with them. The signs are all there that this is a new creation; in the first case the creation of the priesthood and ministerial function of the Church. In the second place, the creation of the Church. The Catechism points out that the original creation was also accomplished through the Holy Spirit. “God fashioned man with his own hands [that is, the Son and the Holy Spirit] and impressed his own form on the flesh he had fashioned, in such a way that even what was visible might bear the divine form,” says the Compendium of the Catechism (No. 704). In the creation story God then breathed his life into his creation. There are serious ramifications to our being the body of Christ. The scribes would have been surprised to hear that. What about the second, public, coming of the Holy Spirit? The group’s reaction to the reception of the Holy Spirit is to immediately begin preaching Christ. What is astonishing here is that they find that the language differences that prevent them from speaking with other people have disappeared. – in the witness of saints. The wind of the God’s Spirit has been blowing through the Church for a long time, inspiring people to stand up like the Apostles and proclaim Jesus — to us, if we’ll listen.